AP Services, a product and service brand of Curtiss-Wright, manufactures valve and pump packing products that have the lowest leak rates and friction in the industry. Style 526 is braided from high quality carbon yarn, treated with graphite particles to lubricate and enhance thermal conductivity. 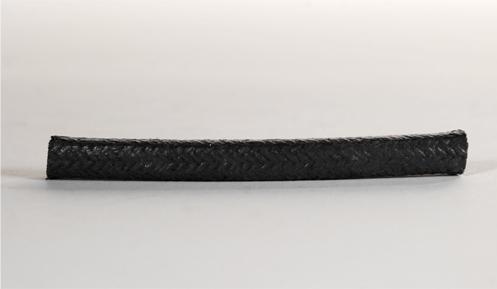 Carbon yarn is a viable alternative to graphite yarn that exhibits nearly the same characteristics; low coefficient of friction and minimal thermal expansion. This long life packing is an alternative to asbestos in severe applications where shaft scoring and minimal leakage is of major concern. Style 526 is suitable for acids, alkalis, hot oils, and steam on high temperature valves, and rotating/reciprocating shafts. Style 526 is available as individual rings, combination sets, and in bulk. AP Services, a product and service brand of Curtiss-Wright, manufactures valve and pump packing products that have the lowest leak rates and friction in the industry. Style 536 is braided from high quality carbon yarn heavily impregnated with PTFE dispersion. Each strand is individually coated with PTFE by a unique process, which controls and evenly distributes the lubricant. Once braided, the complete packing strand is once again coated with PTFE. This combination provides low friction packing whose sealing abilities exceed asbestos-PTFE packing’s. Style 536 offers long life and low shaft sleeve wear. Style 536 is engineered to with stand acids, hot oils, alkalis, and steam on gate, globe and ball valve stems. It is also an excellent choice for use in agitators, mixers, and pumps with rotating or reciprocating shafts. Style 536 is available as individual rings, combination sets, and in bulk. AP Services, a product and service brand of Curtiss-Wright, manufactures valve and pump packing products that have the lowest leak rates and friction in the industry. Style 1515 is manufactured in square cross section by braiding an Inconel wire and carbon fiber jacket over a temperature resistant graphite core. The packing is treated with a corrosion inhibitor and given a surface treatment of dry type lubricant and graphite. This packing contains no rubberized material to harden and no volatile material to cause the packing to shrink. Even at high temperatures, the packing remains, soft, flexible and resilient, always easily controlled by gland adjustments. Style 1515 has proven to be the first viable alternative to asbestos in high temperature valves. Style 1515 SEAL-RITE can be used on valves and expansion joints handling super-heated steam, hot oil, and gases. Style 1515 is available as individual rings, combination sets, and in bulk.